Our paper published in Nature Communications describes the impacts that experimental heatwave conditions have on reproductive biology in a model insect system. Here, I provide some additional background to the research, outline the main findings, and add thoughts for future work. Reproductive biologists have long known that male fertility and sperm function can be extra-sensitive to temperature. Evolution wouldn’t allow important organs producing such vital cells in so many species to hang so vulnerably if there wasn’t a significant benefit to their externalization. In fact, a wealth of research since the start of last Century, mainly on warm-blooded mammals (including humans), has shown that environmental or experimental warming by even a few degrees can cause declines in sperm quality and male ability to fertilise. We don’t really know why sperm cells are so vulnerable to temperature, but their highly specialized function probably has a lot to do with it: not many eukaryotic cells have to individually navigate through a non-self (and sometimes hazardous) environment and transport a perfectly-packaged code for new life to the ovum –often in competition with rival sperm. Despite the wealth of work on fertility in warm-blooded species, which can buffer their body temperatures against environmental variation, scant attention has been paid to the impacts of thermal variation on reproduction in ‘cold-blooded’ ectotherms. Drosophila fruit flies are the exception: fly-flippers are well aware that the upper temperature when populations become non-viable is also the point at which males also become sterile. This lack of knowledge for ectothermic taxa seems an important gap: most of life on Earth is cold blooded – and most terrestrial species are insects. Given this knowledge on heat and male fertility but neglect for ectotherms, it also seems relevant to explore how temperature affects reproduction in cold-blooded species because Earth’s climate is changing at an unnaturally fast rate, and heatwave events are predicted to be more frequent and extreme. We know that biodiversity is responding to climate change, with thousands of studies confirming this in one way or another, and we know that insect numbers are crashing, but we understand remarkably little about the particular mechanisms driving population declines. This isn’t too surprising, because the natural environment, especially when it’s changing unnaturally, is a very complex place. We therefore decided to examine in detail how heatwaves affected reproduction through an experimental approach under controlled conditions in the laboratory, and using a model insect system to inform us about what might be going on in nature. Insects are critical players in almost every terrestrial ecosystem, and ‘To a rough approximation, and setting aside vertebrate chauvinism, it can be said that essentially all organisms are insects.’ (Robert May (1988) Science). The red flour beetle Tribolium castaneum is a truly tractable lab model, which has taught us a lot about reproduction. The beauty of the Tribolium system is that it is very amenable to very well replicated and tightly controlled experiments, and many protocols are established for measuring the dynamics of mating behaviour, reproductive fitness, paternity, egg count and hatch, sperm count and viability, and sperm migration in vivo through the female tract. Our basic approach was to expose mature adult beetles to experimental heatwaves lasting five days at temperatures 5 to 7oC above this species’ optimum for reproduction, and then examine subsequent impacts on offspring output and reproductive biology. Since the thermal optimum for T. castaneum is 35oC, heatwaves ran at 40 to 42oC. It’s worth noting that these temperatures have been exceeded in the natural environment in half the world’s countries over recent years. 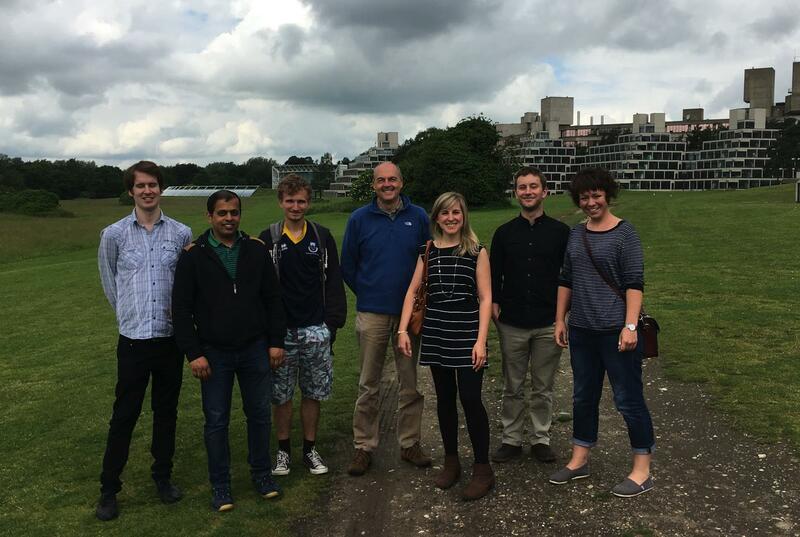 The study ran across a number of years as we ran different assays through a strong and collaborative research team to build up a picture of how heatwaves impacted on reproduction in our model system. 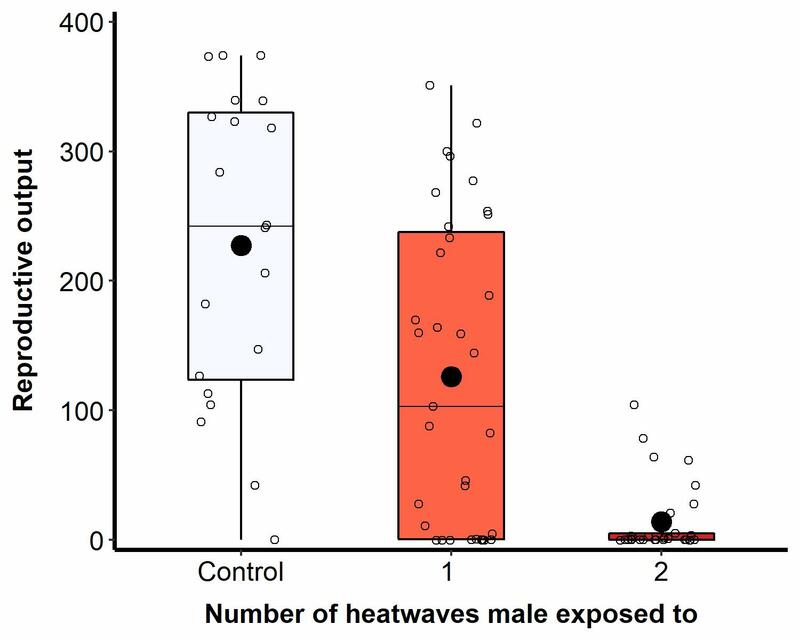 Our findings consistently showed that heatwaves damaged male reproductive potential, but not female. After a 42oC heatwave, male reproductive performance (including sperm competitiveness) halved, while female offspring output remained unchanged. Following a second heatwave, males became almost completely sterile. 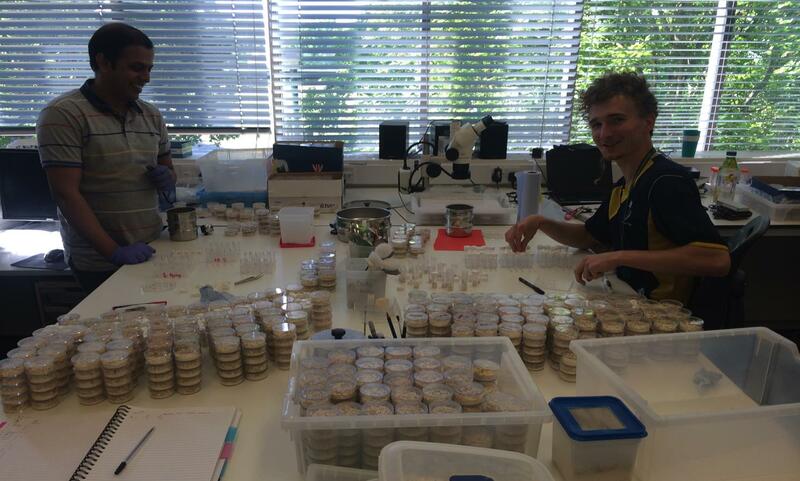 Although female offspring production was unaffected per se, we found that inseminated sperm within the female tract storage sites were vulnerable and damaged by heatwave conditions, reducing a female’s subsequent fertility by a third. Further in vivo and in vitro measures confirmed that the decline in male reproductive performance was sperm-specific. Although male mating frequency decreased following a heatwave, males still mated at a rate that we know is normally sufficient to give females full fertility, and all matings resulted in some sperm transfer. However, egg laying and hatch rate following mating with heatwave-exposed males were greatly reduced. The number of sperm ejaculated within each spermatophore decreased by 75% following male heatwave exposure and, of these fewer sperm inseminated, less than one third were still alive. Finally, in vivo measures within the female using males from a strain modified to carry green fluorescence in their sperm chromatin (GFP beetles generously provided by colleagues at Syracuse University), revealed that heatwave exposure limited sperm migration in the female tract and entry into the fertilization set. The female reproductive tracts illustrated here show one following a normal mating, and the other (on the right) after the female has mated with a male previously exposed to a heatwave. We therefore found detailed evidence for how experimental heatwaves damage sperm function and fertility in an ectotherm system. However, on top of these direct impacts on reproductive output, we also found some unexpected transgenerational effects. Offspring from fathers – or sperm stored in females – that had previously experienced heatwaves, showed reductions in lifespan by about 20%. And sons whose fathers – or fertilizing sperm - had experienced heatwaves, also showed lower reproductive ability, achieving fewer matings and paternity when given access to receptive females, compared with non-heatwaved fathers or sperm. This work reveals that sperm are very sensitive to heat: environmentally-relevant experimental heatwaves damage sperm function, leading to reduced fertility and a decline in offspring performance. Although we do not yet know how this sensitivity affects population viability in nature, damage to such an important fitness trait provides one possible explanation for declines in natural populations as they struggle to survive and reproduce in the face of rapid environmental change and degradation. What more do we need to know about this spermatozoal sensitivity? Although our beetle represents huge numbers of tropical insects, we’d like to know whether this sensitivity exists in other insect systems like butterflies and key pollinators, and more broadly across other invertebrates and into ‘cold blooded’ vertebrates like fish. And we’d also like to know whether temperate taxa are more sensitive than our tropical model? Evolutionarily, we need to measure how quickly and far populations can adapt to novel thermal regimes, so we are using experimental evolution to answer this question. We’d especially like to understand more about the transgenerational impacts we see following heatwave exposure to spermatozoa, and whether this arises though DNA damage, with possible consequences for our own species?